(Newser) – If it seems like giraffes are almost never in the news for a good reason, well, chuck this story on that pile: Zoo Atlanta announced Tuesday that one of its male reticulated giraffes, 8-year-old Zuberi, died in a freak accident. "(Zoo staff) saw some unusual movement in Zuberi's area and saw that he had a portion of his neck in a very small space in the metal railing," Dr. Jennifer Mickelberg tells WSBTV. Zoo officials rushed to help the animal, notes 11Alive, but Zuberi could not be saved. A necropsy will determine an official cause of death, but zoo officials say Zuberi appeared completely normal in the moments leading up to the accident. "It's an area he's really comfortable in. Really, this is just a highly unusual incident," Mickelberg says. So did he snap his neck while turning between some metal pipes? Story is too vague as to what actually happened. 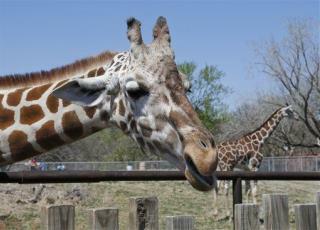 Nashville's zoo has a gigantic habitat for their giraffes, and it's just a wide open field with trees and tall grass. They can be so close that you can damn near feed them, or so far way from the viewing area that you have to get binoculars to see them. The last time I went, they were about 50 yards from the viewing area, and a couple of them started fuh king right there in front of everyone.....I remember my kids saying, "Daddy, what are they doing?" and I remember replying, "Shut up, shut up, you're ruining the mood"